Experience our luxury domed railcars traveling round trip from Anchorage. With a night at Mt. McKinley Princess Wilderness Lodge, and a night at Denali National Park, there’s ample time to experience the abundant wildlife and to visit viewpoints of the "Great One". Board a luxury railcar and journey to the town of Talkeetna, the inspiration for the show "Northern Exposure". You’ll stay at the beautiful Mt. McKinley Princess Wilderness Lodge, featuring quite possibly the most awesome view of the "Great One" in the state. Once there, you’ll have time for optional activities such as flightseeing and river tours. Overnight Mt. McKinley Princess Wilderness Lodge. You'll continue your journey to Denali on our domed railcars. 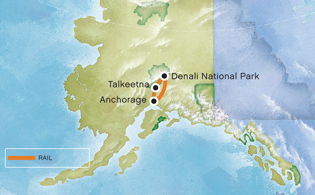 This afternoon, you'll arrive at Denali National Park. You will get to Denali with plenty of time to explore the area and take an optional excursion or two like fly-fishing, backcountry jeep adventure or dog kennel tour. Overnight Denali-area hotel. Take time this morning to enjoy a park-sponsored activity or join a Ranger-led hike from the informative Denali Visitor Center. Later, re-board a glass domed railcar and enjoy the return leg of your Alaska train ride to Anchorage. Your tour ends at the Alaska Railroad depot in Anchorage.